Handcrafted and small batch, live botanical drinks. Old Tree Kombucha is known for its well-balanced full flavour, delicately floral with a tangy, appley sweetness and champagne-like character. Best enjoyed as a low alcohol option at social events, or as a digestive aid with a meal, it also makes an incredible cocktail mixer with both gin and rum. Old Tree Botanical shrub is an apple cider drinking vinegar. We brew a citrus-infused kefir like no other with our Water Kefir culture. 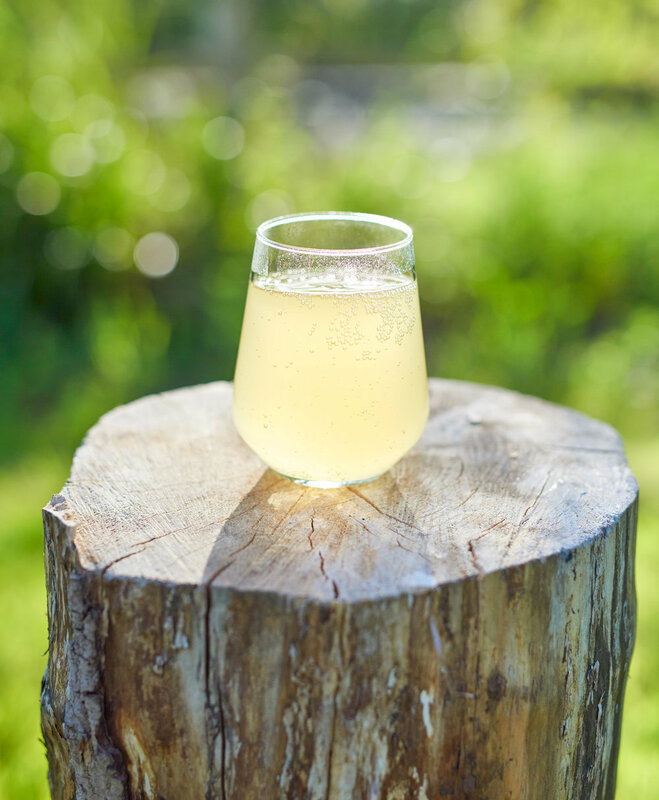 Not to be confused with Milk Kefir (that is salty and sour in taste) this drink is known as nature's probiotic soda - a lightly fermented vine-fruit infused lemonade. A probiotic tonic for anytime of day and an exceptional mixer for cocktails. A rich, naturally carbonated, pearlescent orange tonic to cleanse and revitalize. Zingy citrus flavours are the complimented by earthy tones of turmeric. This is full-flavoured enough to replace wine or beer and its low alcohol content means no intoxication. Black pepper is added to every batch to activate the Curcumin. The elixir of British hedgerows and perfect celebration drink. Citrus and elderflower combine to create a euphoria-inducing, champagne like drink that brings out the joy in people. The name Ebulis comes from the name of the european Elderflower variety - Sambucas Ebuils, where the word Ebulis comes from the root Ebulire – which means 'bubbling over' with excitement! 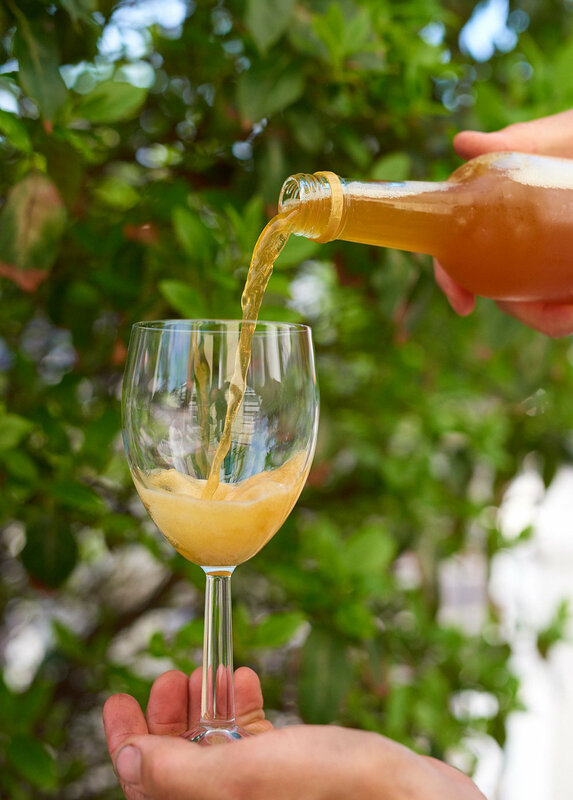 Probably the most authentic cider in the world – definitely one of the most sustainable! This is a vintage dry cider that we make every year from the apples of a stunning orchard in Somerset. Famous and classic varieties of cider apple such as Yarlingtons Mill are blended with a small amount of eating apples. The drink is cold-pressed with the music and laughter of volunteers at our annual apple harvest festival. An irresistible blend Apple and Elderflower, well-balanced and gently sparkling. Dry enough for the real cider lover yet sweet enough for most palettes. Crisp and fruity with a classic cider nose and finish. This is a hugely popular drink for events and parties. This is our soft drink that changes colour throughout the year as we make as much use of abundant wild botanicals as possible. Lavender Lemonade, Nettle Ice Tea, Sea-buckthorn Elixir, Honey Dandelion and Burdoch and Rosehip Tonic - are a few of our previous creations. "Recently I was diagnosed with a condition that meant I couldn't drink alcohol. As a great lover of wine and beer, this led to me feeling very depressed and unhappy - until I discovered Old Tree Kombucha. The depth and complexity of flavours in this kombucha are extraordinary. What's more, unlike high alcohol drinks this actually feels good for me when I drink it. 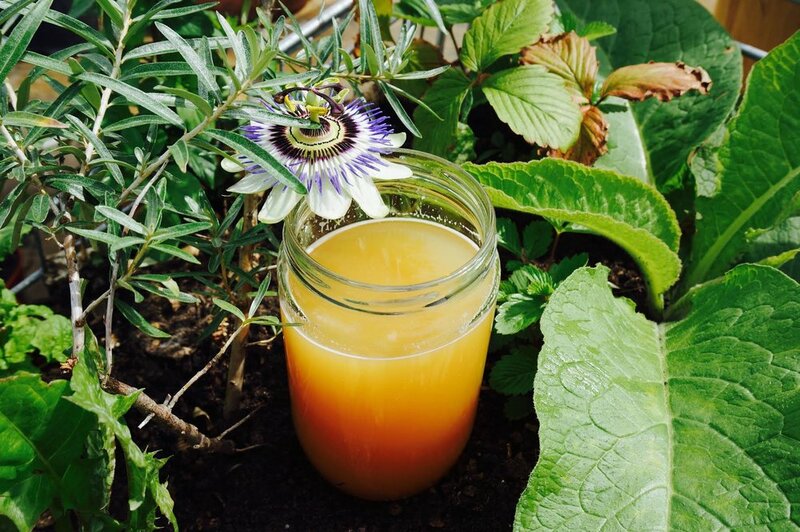 If you love your senses and value quality, I couldn't recommend Old Tree Kombucha more highly." "By far the nicest kefir I have ever tasted." "We were over the moon with the drinks Old Tree provided for our wedding day. A beautiful bespoke botanical mix of elderflower and honeysuckle. They listened carefully to our requests and responded with a creative product that was truly perfect and made with such wonderful attention to detail, including personalised labels for the kegs!"